DBBL HSC Scholarship Circular 2018 Dutch Bangla Bank Education Scholarship: Dutch-Bangla Bank, under its social cause program, has been awarding the scholarships to the meritorious students in need of financial aid studying at different levels of education since its beginning. DBBL awards new scholarships every year along with renewal of existing awardees. The Bank has given scholarships to the deserving students from huge applications following a set of criteria such as the applicant’s academic results, financial capability, physical conditions etc. Around 90% of the scholarships have been given to the rural students and 50% to the female students. DBBL HSC Scholarship Circular 2018 Dutch Bangla Bank Education Scholarship: Dutch-Bangla Bank has been awarding scholarships to meritorious students in need of financial aid studying at higher secondary, graduation & post graduation levels. Dutch Bangla Bank DBBL HSC Scholarship 2018 DBBL Education Scholarship: Dutch Bangla Bank DBBL HSC Scholarship DBBL Education Scholarship has been published by the DBBL authority. Those students who were passed the HSC or Equivalent examination in 2018 and got a GPA 5.00. In the intercity, the corporation needs to minimum Golden A+ that means all subject plus. But the out of the city corporation area student must have 4.50 without 4th Subject. It is very interesting to notice that the Dutch Bangla Bank HSC Scholarship Result 2018 has been published tomorrow 25 July 2018 on their official website. If you want to apply for the Dutch Bangla Bank HSC Scholarship Result, you should need to fill up an online scholarship form by using the internet. Every year Dutch Bangla Bank limited Donate lot money to the poor and meritorious student. Those candidates who were passed the Higher Secondary Certificate or equivalent examination from rural or backward area educational institute. The almost Dutch Bangla Bank scholarship 2017 is getting 90% and girl student getting almost 50% scholarships. Dutch Bangla Bank DBBL HSC Scholarship 2018 DBBL Education Scholarship: Dutch Bangla Bank DBBL HSC Scholarship DBBL Education Scholarship has been published by the DBBL authority. 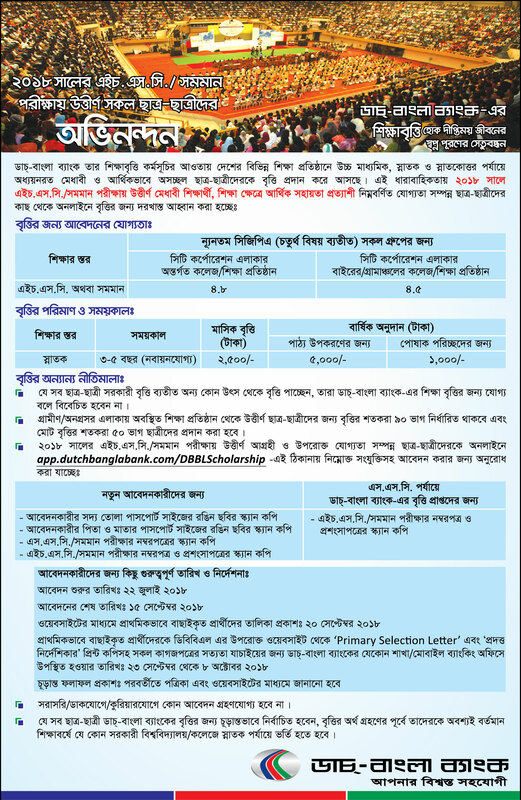 Students availing scholarship from other sources (except Government scholarship) will not qualify for Dutch-Bangla Bank Foundation (DBBF) scholarship. 90% of total scholarships will be earmarked for students who passed H.S.C./equivalent examinations from the Institutions in rural areas and 50% of total scholarships will be earmarked for female students. Scanned mark sheet of S.S.C./equivalent examinations. The Student who availed Dutch-Bangla Bank Scholarship after passing SSC exam. only in 2015. Scanned mark sheet and testimonial of H.S.C./equivalent examinations. Publication of final result: To be notified later through Newspaper and Website. The students finally selected for DBBL scholarship should get him/herself admitted at bachelor level within the current academic session in a public university/college before availing scholarship money. No direct application will be accepted.